Be the Poppin Hoppies Champ! The game for girls and boys that keeps players on the move grabbing Hoppies as they jump! Which Hoppie will pop next? Can you catch it first? Will you catch the Hoppie you want? 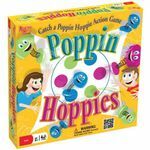 To win, be the first to catch 6 Poppin Hoppies and create a complete character!